TAFT, Calif. — For years, Larry Robison and his wife have taken care of their son's grave at West Side Cemetery District. They designed something similar to a picture frame around his headstone made of wood chips, visiting multiple times a week for the past few years to maintain it. District Manager Joel Bauer said this breaks the cemetery rules and at first, he turned a blind eye to it, but he said recently it's fed a larger problem so he told the parents they must remove the display. The rules posted read "Do not place crosses or other wood, metal, ceramic, or plastic grave location markers on graves." Bauer argues the wood used to maintain the display breaks that rule, but Robison says his display is not a cross or marker so he is not breaking the rule. In addition to their disagreement on the wording of the rule, Bauer said recently, other visitors have seen Robison's display and copied it. The problem is that Robison is careful to follow another rule that states "Please do not place any dirt, sand, gravel, rocks, cement, casting plaster, metal or marbles in floral vases provided by the Cemetery." 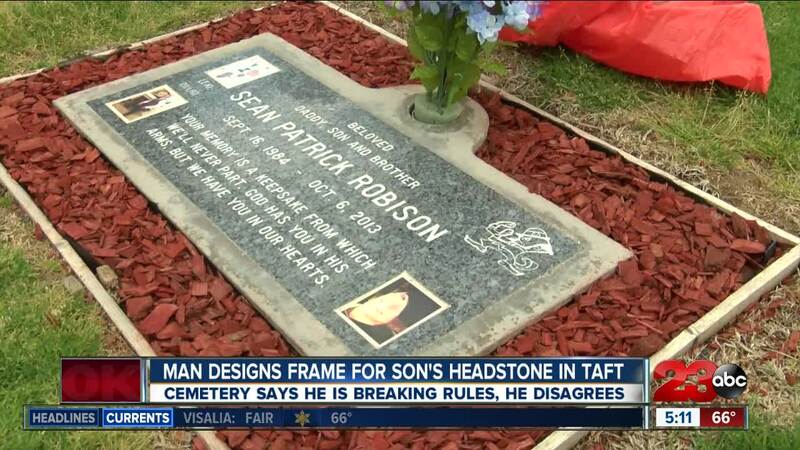 He uses wood chips to frame the headstone, which are not listed on the banned list. However, other visitors who are copying his idea use marbles and rocks, which are not allowed and create a safety hazard. Due to the growing number of people adding borders to headstones in an improper way, Bauer said the Cemetery is cracking down. "I can't enforce one issue without enforcing all of them. I have to be equal across the board and unfortunately he gets caught up in that," said Bauer. For Robison, he doesn't want to lose one of his ways to keep his son's memory alive. "I don't want to tear it up, it breaks my heart, but I don't know what else to do," said Robison. Robison said he plans to attend a meeting for Cemetery management to plead his case on why he should be able to keep the display. Bauer said he'll talk to the supervisors to clear up any gray area in the rules.